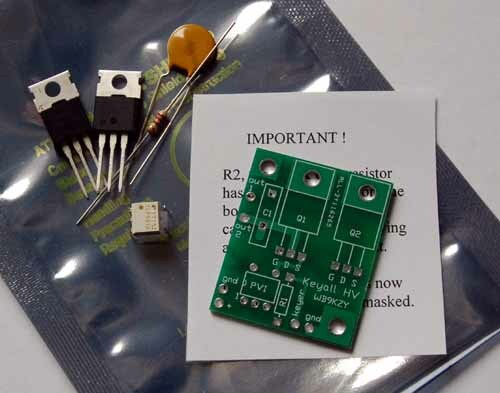 The Keyall HV kit allows the owner of a keyer with a low voltage positive (NPN or n-channel MOSFET) keying transistor to drive the vacuum tube transmitters and transceivers of yesteryear. This unit will key negative voltage rigs (grid block keying) or positive voltage rigs (cathode keyed tube transmitters and conventional +13.8V powered solid state rigs). The output transistors and capacitor are rated at 1000 V and 3.1 A (3100 mA). The Keyall HV will normally key a single transmitter. The Keyall HV kit is an update of the original Keyall kit. 11/03/2015: NEW - a $14.00 version of the Keyall HV is now being offered with 500 volt (IRF820) transistors instead of the stock 1000 volt transistors (IRFBG30). The Keyall HV circuit has been used for high power external amplifier keying by Gary, KD9SV. W0VLZ provided this link to his experiences with the Keyall, thanks Niel. Pat, W0BM, supplied this link to a 3D printed case design for the Keyall HV, Thanks Pat ! September 30, 2017: A customer has encountered keying problems with a Heathkit DX-40 (cathode keyed rig), the problem was solved by removing R2, the 100k ohm resistor. This may lengthen the key down slightly (3 milliseconds?) - it's probably only needed IF the Keyall HV is used at higher current levels (175 mA and above ?). The customer reported that the DX-40 keying sounded OK on a shack receiver. Printed manuals available for an additional charge or save money by downloading (Right click/save target as) and printing the revised manual , schematic and hookup diagram (unchanged). For kits purchased before May 2019: manual , schematic and hookup diagram. The graduations are 5 mS per division horizontally and 1 volt vertically.